If you love National Parks, you need to do Nature’s Way! Touring the Top End is full of surprises. Considered one of Australia’s great road-trips, Nature’s Way is a loop taking in Kakadu, Nitmiluk and Litchfield National Parks. The round trip is approximately 1,000 kilometres suitable for 2WD vehicles. With so many National Parks it’s no wonder they designed a road-trip to take in the best of the best. If you have come to the Top End to experience our culture, our wildlife and our extraordinary scenery, Nature’s Way really is the best way to experience it all! A ‘Drive It Yourself’ (DIY) holiday of a lifetime! Nature’s Way takes you from Darwin through to Jabiru in Kakadu National Park, south to Katherine to take in Nitmiluk National Park and then back towards Darwin stopping off at Litchfield National Park on the way. We recommend you take at least a week to truly enjoy the loop, here’s our suggested 7 day itinerary to enjoy Nature’s Way. Start your journey in Darwin, the Northern Territory’s multicultural capital, and take the Arnhem Highway towards the World Heritage-listed Kakadu National Park. Check in at your hotel or cabin to freshen up and be ready to climb Ubirr Rock (it’s an easy climb) for extraordinary sunset views over the Arnhem Land escarpment. If you’re an early morning person, sunrise is just as spectacular and likely to be less crowded. Read more about what to do whilst you’re visiting Kakadu right here! Visit the Bowali Cultural Centre and take the cultural discovery tour to learn about the custodians of this land and it’s importance to the Bowali people. 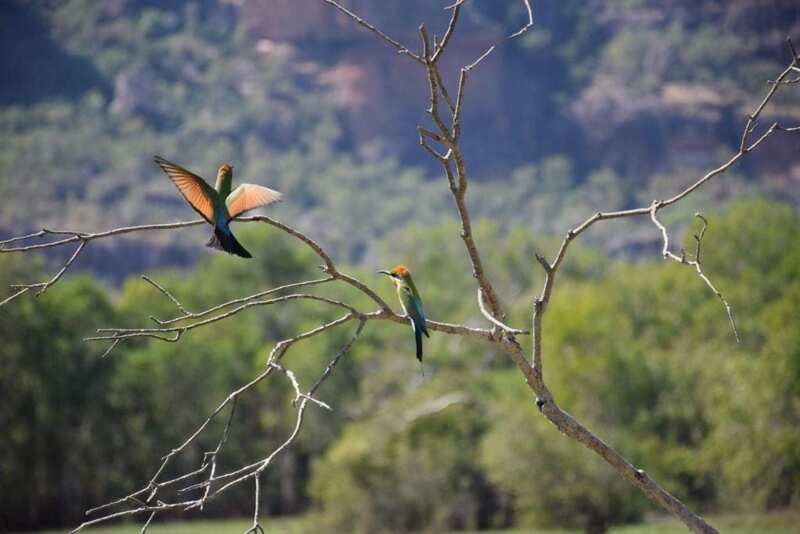 Explore ancient Aboriginal rock art at Nourlangie Rock, to see an abundance of wildlife including the stunning Rainbow Bee eaters. Take one of the walking trails to Gunwarddehwarde Lookout and visit the magnificent Anbangbang Billabong. At Cooinda make sure you do one of the Yellow Water billabong cruises on a billabong fringed by pandanus, paperbark swamps and monsoon rainforest. The cruise will take you through wetland waterways where you’ll see a range of wild buffalo, crocodiles and thousands of unique birds as the sun sets in the distance. For the more adventurous – take a tour to magnificent Gunlom Falls, Maguk Gorge, Jim Jim Falls or Twin Falls. A reminder: if you’re swimming in the Top End, always ‘be crocwise‘ and check the signs before swimming to make sure it is safe to take a dip. Take the southern road towards Pine Creek en route to Katherine and nearby Nitmiluk National Park. Historic Pine Creek is still an active gold mine. The township is slightly off the Stuart Highway but is a good place to stop for lunch and visit the Railway Museum, the Old Repeater Station and the Mining exhibition. 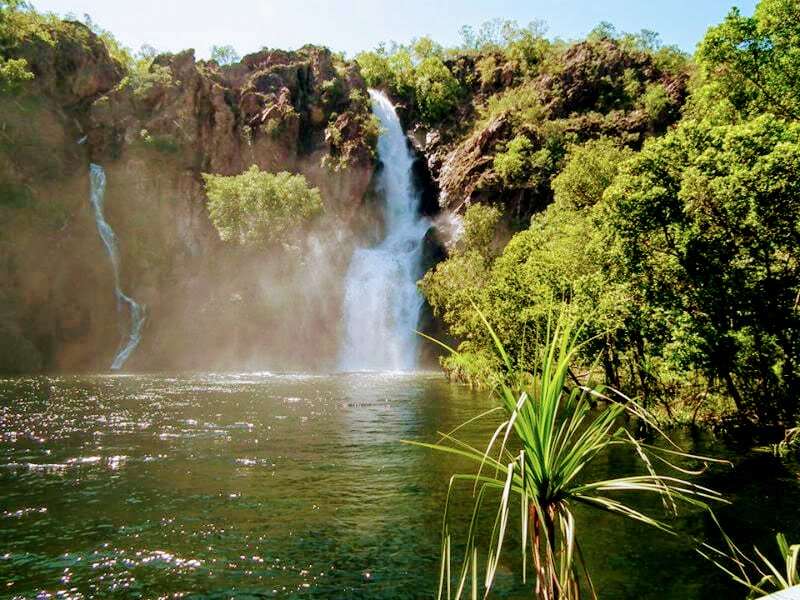 Stop in at Leliyn – Edith Falls is located on the western side of Nitmiluk National Park. The lush, grassy campsites make Edith Falls an idyllic spot for camping. The large pandanus-fringed natural swimming hole is perfect to relax in at the base of the falls. Walking trails take you up to the swimming holes above Edith Falls which are well worth the walk. Edith Falls is open for swimming most of the year, although during the ‘wet season’ it may be closed. Katherine is a short 60 kilometres drive south along the Stuart Highway. Katherine township is the gateway to Nitmiluk National Park. 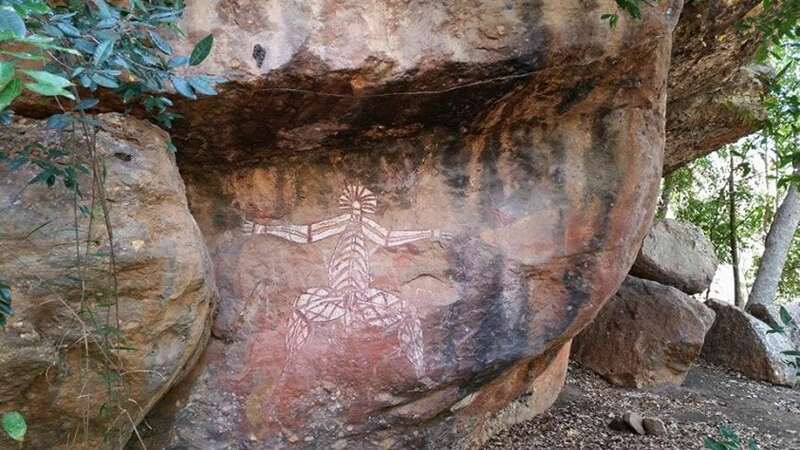 Nitmiluk National Park is located on the lands of the Jawoyn people and has some of Australia’s most stunning scenery and bush walks throughout the gorge. Visit the Cultural Centre for an excellent presentation of early settlement history and cultural artifacts. 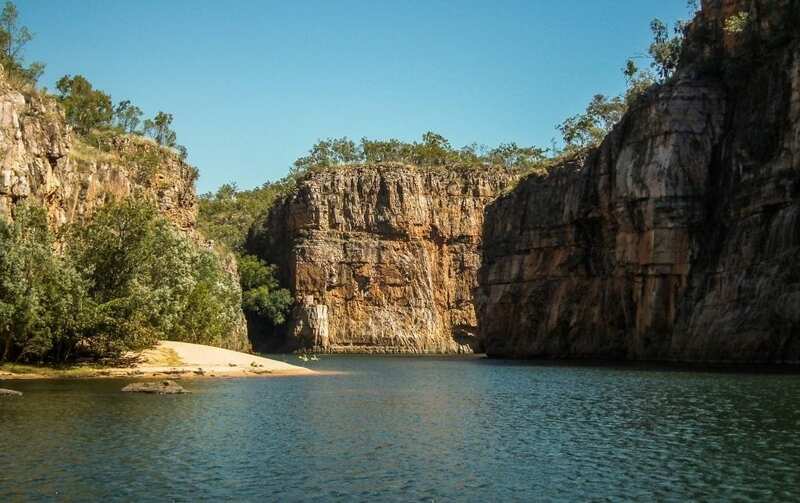 Nitmiluk Gorge has some of the most stunning scenery in the NT and is laced with cascading waterfalls and imposing sheer rock cliff faces towering some 70 metres above. Some of the Territory’s best adventure activities can to be enjoyed in Nitmiluk National Park – canoeing, bushwalking, gorge cruises, swimming and camping out under the stars. 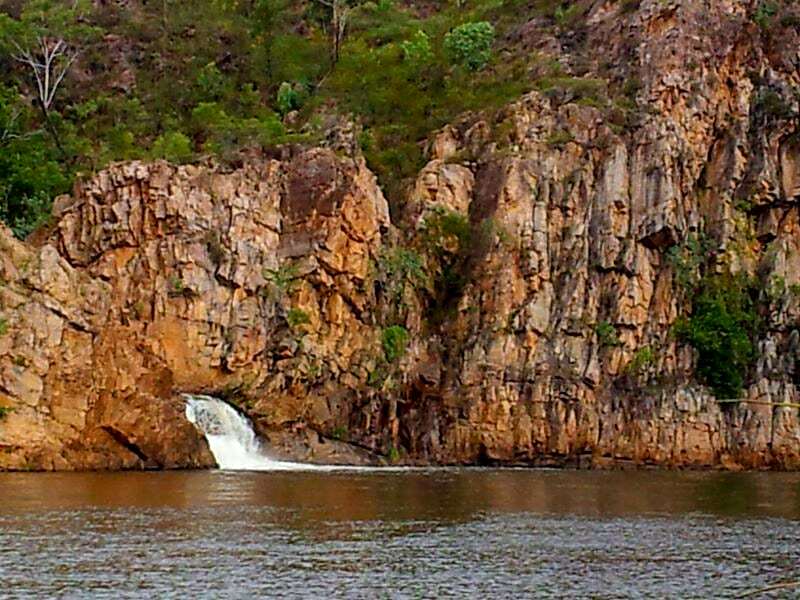 Take a cruise up the spectacular Katherine Gorge. A sunset cruise will bring out the vivid colours on the sandstone walls of the gorge reflecting the intensity of the setting sun. The colours will literally take your breath away! About 20 minutes drive south of Katherine town is Cutta Cutta Caves. Inside the caves you’ll see sparkling limestone formations of stalactites and stalagmites and several species of bats including the rare ghost and leaf-nosed bats. Read more about things to do while visiting Katherine. Stop into The Adelaide River Hotel for an early lunch on your way to Litchfield Park. Charlie the buffalo from the Crocodile Dundee movie is behind the bar! Great value steaks, barra and buffalo burgers served with loads of friendly, outback hospitality. Litchfield National Park waterholes are generally crocodile free but monitored closely. 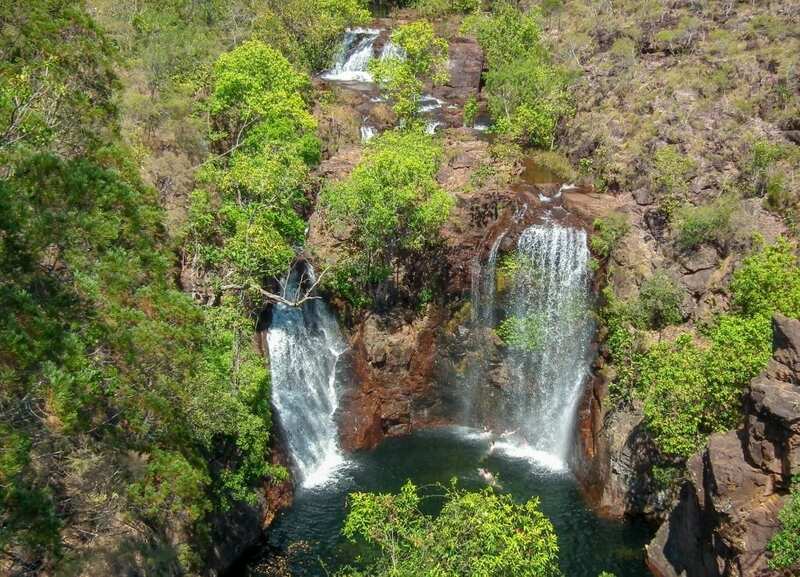 Several major freshwater swimming holes are scattered through Litchfield National Park fed by beautiful waterfalls. Most will be open for swimming year round. You can visit all of the most spectacular ones on a day drive from Darwin and most are 2WD accessible. Termite Mounds: The first thing you’ll see when you enter the park is a large group of “magnetic” termite mounds – 2m-high blades, all aligned north-south to keep the inside of the mound cool against the heat of the sun. Buley Rockhole: Enjoy a refreshing swim in the cascading pools of Buley Rockhole. A chain of spa-like pools linked by small waterfalls. It’s one of the most popular places to swim the park. Wade through the pools, absorb the scenic bush surrounds or sit and relax, as the cool water rolls over your shoulders. Open for most of the year. Florence Falls: Take a refreshing dip in the crystal clear waters of the pool and enjoy the scenic walk to the viewing platform high above the falls for panoramic views of the open valley and the waterhole below. Tolmer Falls: One of the most spectacular falls in Litchfield National Park. It cascades over two high escarpments into one deep plunge pool. A short walk takes you to a viewing platform at the top of the waterfall. From here you can take the 800 metre walk – an easy walk that takes about 45 minutes. Swimming is not permitted above the falls. Wangi Falls: Where two waterfalls cascade into a very large plunge pool set amid the rainforest. It is the most popular of the swimming holes, and includes wheelchair access into the water. 4WD access only: Lost City: 4WD-only track to the Lost City a group of fantastically-shaped eroded sandstone towers. From Wangi Falls, return the way you came into Litchfield for the easiest way back to Darwin or head north-west taking the unsealed road recommended only for high clearance vehicles. It is unsealed and may be inaccessible in the wet season, but it’s very pretty with several shallow creek crossings. The national parks in the Top End are accessible, pristine and spectacular. You will see rare native plants and spot unique birds and animals in the wild. Go for a bushwalk, swim in the natural swimming holes, enjoy the waterfalls and join an Aboriginal cultural tour to learn more about this land. You will love your Nature’s Way road-trip! Don’t miss another magical sunset! 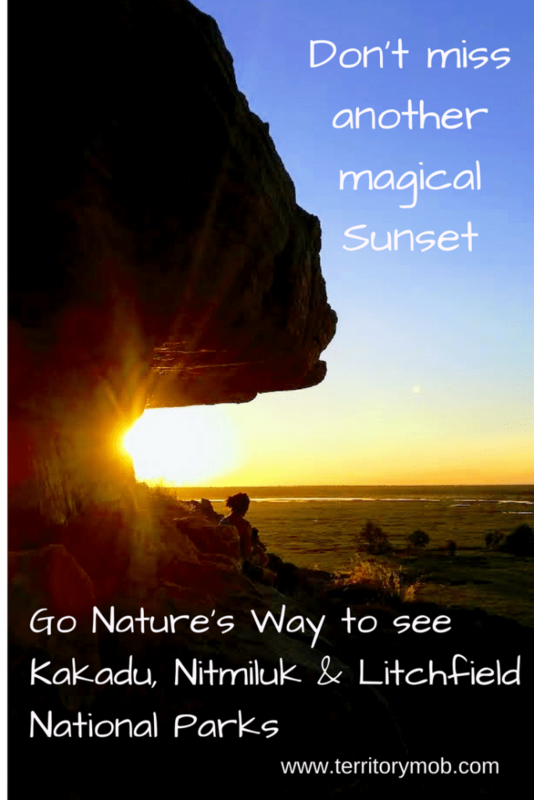 Have you traveled the Nature’s Way loop to Kakadu, Nitmiluk and Litchfield National Parks yet? It’s an extraordinary trip which will showcase the spectacular Top End. When are you coming to visit?